In-house custom orthodontics is on the horizon. With the advent of of accurate and inexpensive resin 3D printing it is now obvious to many that in-house clear aligners are the future of specialty orthodontic care. As market penetration of intraoral scanner approaches 100% among orthodontic specialists the means to manifest these “models” physically cannot be far behind. Over the next 5 years there will be an explosion of resin 3D printing in orthodontic office around the world. 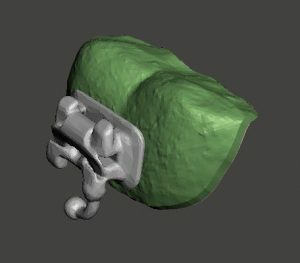 Once an orthodontist has the ability to manufacture a same day or same appointment Essix type retainers using their 3D printers instead the alginate and stone technology from the last century; how far behind can be in-house clear aligner for the correction of minor problems such as food impaction spaces, minor rotations and orthodontic relapse? An STL custom base with bracket attached. this custom base STL is 3D printed in medical grade stainless steel. The resulting bractet is shown in the next figure. 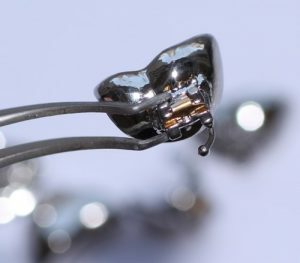 3D printing has the potential to revolutionize orthodontics. Rather than working with third party entities to purchase stock fixed orthodontic appliance systems or in some cases using third party entities for the fabrication custom fixed appliance systems such as Invisalign or Incognito we will soon have the ability to fabricate these appliance systems in-house. We believe that many cutting edge orthodontist will soon be printing in-house custom appliances for their patient using both resin and metal 3D printing technology. At Riolo Orthodontic we have been employing these technologies to improve the care we offer our patients. We are dedicated to providing the best possible orthodontic care aesthetically. We believe that not only should your smile look great after treatment but it should also look great during treatment!